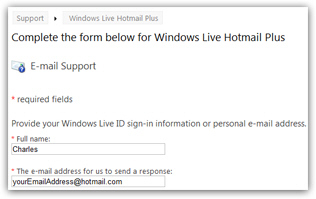 While the free version of Hotmail gives you limited access to Hotmail customer service, Hotmail Plus subscribers are given direct contact option to call Hotmail support by phone ("Phone Support"), send an email to tech support ("E-mail Support"), or use live chat ("Interactive Chat Support") to ask questions to a customer service representative. Being a subscriber to Hotmail Plus also gives you privileged access to Hotmail tech support (you are able to email them directly, something not available in the free version of Hotmail). The phone number for customer service and billing inquiries is designed for Hotmail Plus subscribers only, and is not a tech support phone number. Under the menu, choose "More Options"
Then, click on "View or edit your personal information"
Scroll down to "Windows Live Hotmail Plus options", and click on "Get support"
Notice that the button is on the left, indicating that when you call a Hotmail support request by phone, they can only help for customer service issues (not tech support). Currently, Hotmail's toll free customer service phone number for the US is: (866) 672-4551 / (866) MS BILL 1, and their call center is opened from 5am to 10pm (Pacific Time) on weekdays, and from 5am to 5pm on weekends. To find the Hotmail phone support number for your country (if other than USA), just follow these steps and call your local Hotmail support team. Since the Hotmail support line number can change, you may want to follow these steps to make sure you are dialing the right number. To contact tech support (and troubleshoot technical problems), click on the E-mail button in the "Technical Support" column. To email Hotmail customer service (for things like billing issues), click the E-mail button on the left (choose the right one to reach the proper customer service representative / tech support specialist). Tip: No Hotmail support email address is explicitly given, probably to avoid having it posted online. But fill out the support form, and an email will be generated and sent to Hotmail tech support or customer service, as the case may be - and they will themselves reply by email to your support request and questions. Finally, you can contact the Hotmail support team by chat, right from your browser: this will load the same contact form seen in the contact Hotmail support by email section above, from where you will be able to launch your tech support or customer service request. If you want to cancel your Hotmail Plus subscription, no need to contact Hotmail customer service / tech support - just follow the steps outlined in the underlined tutorial.